Listed on the National Registry of Historic Places, enjoy the romance and charm of The Beach Rose Inn, tucked away on a quiet lane in the quaint Village of West Falmouth. Guest rooms are tastefully decorated in an individual style of their own - all have private baths and air conditioning. Many feature whirlpools, fireplaces, and canopy beds. 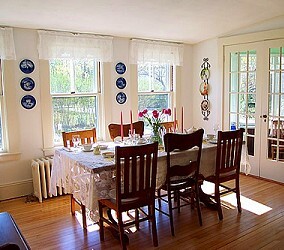 A full breakfast is served daily in the cherry Garthering Room and Sun Porch. 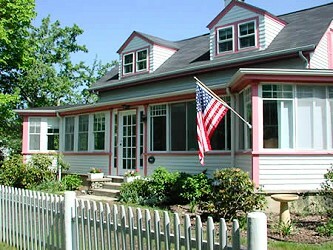 A two bedroom Cape Cod Cottage, complete with sitting area, full kitchen, and private porch, is also available. Listed on the National Registry of Historic Places, enjoy the romance and charm of The Beach Rose Inn, tucked away....(the same until the last sentence.) The two acres of grounds, with gardens and an original field stone wall, enhance the peaceful old Cape Cod ambiance of the inn. A short walk away enjoy antique shops, a turn of the century market, ice cream parlor, art gallery, and European cafe. Beaches bike paths, Woods Hole, and the ferry to Marthas Vinyard are all nearby. Rates: $95-$225... $25 for third person; MC/Visa accepted; three night minimum stay July and August. This and other Falmouth Bed and Breakfast Inns can be found here online in The Register. A warm comfortable bed and a tasty breakfast can make for a great business or vacation travel day!